Super-Sod of Charlotte welcomes 20-year green-industry professional Brandon Pope as the newest outside sales representative. 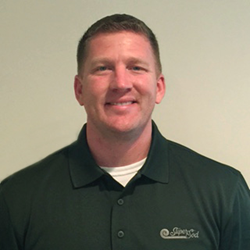 Brandon Pope joined the Super-Sod of Charlotte family as an outside sales representative. Brandon brings with him a wealth of experience and a level of professionalism that will be of great help to us as we expand the Super-Sod footprint here in the Carolinas. The beginning of 2017 marked the welcome of Brandon Pope to the Super-Sod family as the newest outside sales representative for the Charlotte, North Carolina, area. Pope attended North Carolina State University and has been working in the green industry for 20 years. His time in the industry has given him experience in various roles beyond sales, including positions in lawn maintenance, wholesale and landscaping. Though new to the company, Pope has enjoyed the community and culture of Super-Sod. Pope says his favorite part of working at Super-Sod is his team of coworkers in the Charlotte area. Given his passion for serving the company, Pope is on a mission to help his new team succeed. “My goal as outside sales representative is to build customer relationships and grow our business,” Pope said. When he is not selling sod, Pope spends time with his wife of 13 years. His hobbies include hunting and boating, along with other outdoor activities. Pope also serves as an advocate for animal welfare through his involvement in pet rescues. Super-Sod, a subsidiary of Patten Seed Company, is a family run business that employs experts in turf and horticulture. Patten Seed Company began in 1893 in Lakeland, Georgia, as a general store, providing seed for customers. Since then, Patten Seed Company has brought innovation to the turfgrass industry through production of different seed and sod varieties. Super-Sod was formed in 1980 to market sod to expanding urban markets. Along with turfgrass sod and seed, the company offers BigYellowBags of Soil3 organic compost for improving all soils from vegetable gardens to lawns. Super-Sod continuously develops new garden products; fosters gardening and landscaping; and seeks improvement in farming practices, technology, environmental stewardship and employee knowledge. Super-Sod of Charlotte is located at 12600 Downs Circle, Pineville, North Carolina. Learn more about Super-Sod at SuperSod.com.